4x12 Deflecto Contemporary White Plastic Register Discounts Apply ! Floor air registers can be used in virtually any room in your house. White diffusers have a clean finished look with rounded edges. These floor air registers are your perfect solution for high moisture areas. They are made from a strong plastic that won't rust. Because white diffusers are neutral in color, they blend in with most decorating styles. Floor air registers are a practical and affordable way to give your home an updated look. When using these 4x12 white diffusers there's no need to worry about fingers or paws getting burned, because the plastic faceplates don't get as warm as metal registers. Floor air registers now come with an easy to use sliding damper. 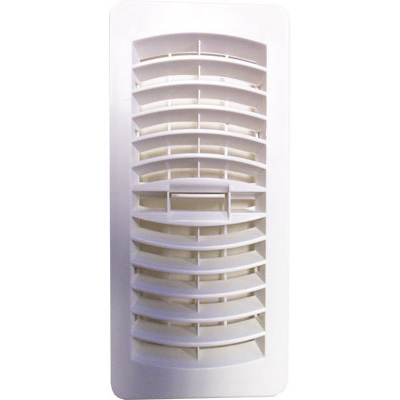 Faceplate Size: 5 1/8" x 13 1/8" Drop-in Depth: 1 1/4"
Order your white diffusers today to give your home a finished look!